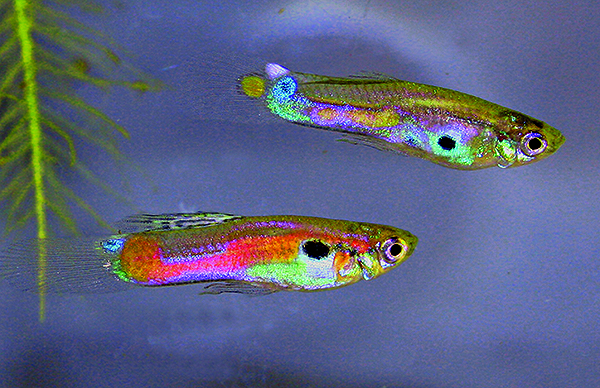 Feral male Guppies caught in Germany’s Gillbach River near the outflow from a coal-fired power plant. Credit: Juliane Lukas. Who knows where the Guppies are? For 40 years, the Gillbach River, near the coal-fired Niederaussem power plant, has been known for its tropical fishes (Kempkes et al. 2009, Jourdan et al. 2014). The media have reported several times about people spotting cichlids, Ancistrus, and guppies, and reports of Asian shrimps and pantropic water plants are not uncommon. This makes the Gillbach an ideal site for investigating the influence of invasive species on native species diversity. This type of study is urgently needed, as awareness of the impacts of invasive species can be very helpful in the context of global climate change. But is the Gillbach the only place where feral guppies occur? This is what we want to find out. We are researchers from the Leibniz Institute for Water Ecology and Inland Fisheries, working with the Society for Ichthyology, the Erftverband (a water management corporation), and guppy expert Michael Kempkes. If you know of any places where feral guppies or other tropical fishes occur, please email us at guppy@igb-berlin.de. Please provide as much information as possible about the location (ideally, GPS coordinates or exact description). We plan to report on the results in a later issue. Editor’s Note: Readers of the English-language AMAZONAS outside of Germany are also invited to share reports of feral Guppies in their own local waters. Information may be posted on our Reef to Rainforest site and will be published in a future issue of the magazine. Has the Robson Guppy truly disappeared?